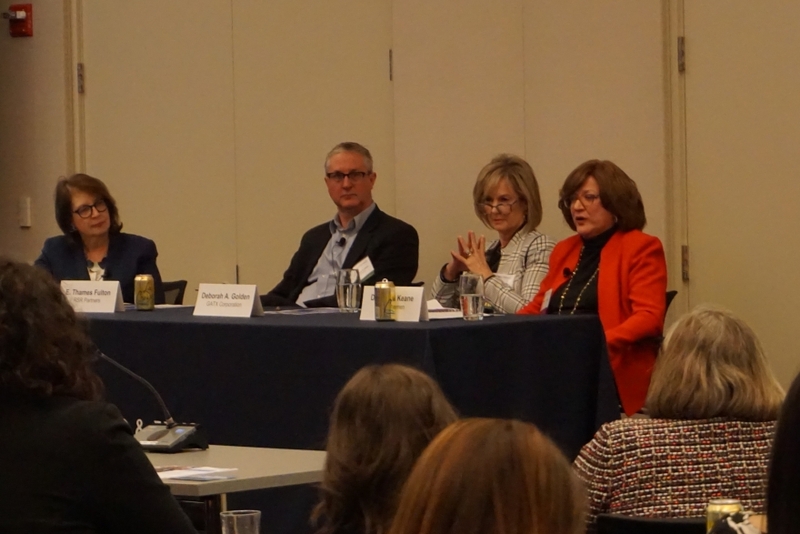 On April 3, 2019, Partner Stephanie Scharf moderated DirectWomen’s regional program, “Breaking into the Boardroom: the Pathways and the Process.” The seminar was hosted by Kirkland & Ellis LLP. DirectWomen is a national nonprofit that works to increase the representation of women lawyers on corporate boards by identifying leading women lawyers who can provide the experience, business judgment, and diversity required for board effectiveness and outstanding corporate governance. The April 3 program focused on the multi-step process for obtaining a corporate board seat and the personal steps that can be taken to enhance selection. Over 75 senior level women lawyers from corporate law departments and law firms participated in the seminar. Pictured (l. to r.) are Moderator Stephanie Scharf, partner with Scharf Banks Marmor LLC and Board Member of DirectWomen; E. Thames Fulton, Managing Director RSR Partners; Deborah Golden, General Counsel of GATX; and Denise Keane, Chair of DirectWomen and former General Counsel of Altria Group, Inc.
Click here for more information on DirectWomen.